What's the best way to light up a subject that's far away? I am shooting a wedding for a family friend, and one of the shots she would like is of them both standing on a balcony over a stairway. It's an old building they're getting married in, and it is a beautiful idea for a photo. I took a test shot and the room and stairs are covered in dark wood, making the light terrible! The idea is I will be down below, looking up at them to take the photo, so a flash would be useless. Is it just a matter of asking them to stay as still as possible, use my fastest lens, slow down the shutter and turn up the ISO if necessary as well? Or is there something I haven't thought of. The idea is I will be down below, looking up at them to take the photo, so a flash would be useless. Only if you limit yourself to a camera mounted flash. The key to such a shot is to get the lights off the camera and onto the subjects from angles other than the optical axis of the lens. You'll probably need at least a couple of off-camera flashes with appropriate modifiers (softboxes or other translucent screens) and maybe a reflector or two. An entire course in how to light such a shot is beyond the scope of an answer here, so here are a few links to get you started. Simple Off-Camera Flash Techniques for Stunning Photos! We also currently have 237 questions here with the Off Camera Flash tag. You might find many of them useful. There are also many other questions about specific wireless flash and triggering systems and how to get them to work the way you desire. In addition to what Michael has already stated, depending on the configuration, you may want to create a composite. 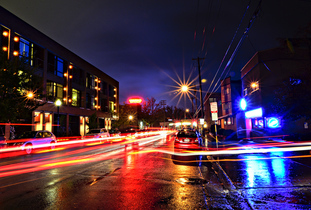 Long exposure for the scene only and then add the lights and couple to overlay on the scene you already took. This eliminates the need to hide the lights in the shot. If the space is large, you aren't likely to get it all lit artificially, and it may require a long exposure to get a proper exposure (and possibly a more natural look with respect to how it's lit). Not the answer you're looking for? Browse other questions tagged lighting low-light off-camera-flash wedding or ask your own question. What's the best way to shoot aerial dancers in low light conditions? What's the best way to light still-life photos of leaves? What's the best way to get thumbnail portrait shots for a company intranet? What's the best bang for your buck to improve low light portrait shots: Lens, Flash or Body? What's the best way to minimize wedding picture time? What's the best technique to take brighter photos in demanding low light conditions?